A Mexico trade mission organized by Enterprise Florida bolstered businesses seeking – and matched with – trade partners across the border. The biggest beneficiaries were Florida’s ports, which signed a memorandum of understanding with the Mexico Gulf Coast ports. The May 23 to 26 trip saw directors from key ports strike a strategic alliance between Florida and Mexico to increase trade and traffic. Juan Kuryla, director of PortMiami, found his trip successful after he eyed establishing a trade route to hasten distribution of goods from Mexico to the US. PortMiami was among six Florida ports on the trip to sign the memorandum of understanding that applies to all Florida ports and to all Mexican Gulf Ports including Tuxpan, Tampico, Morelos and Velacruz. The Florida ports have constantly proposed to Mexican maritime authorities that shipping products by water to Florida is cheaper than the traditional truck routes from Mexico to Texas. Attorney Alan Becker, vice chair of Enterprise Florida’s board, went on the trip and was pleased with the results. He said he was happy to see that Florida and Mexico will expand their trade services, saying that Florida will be able to distribute Mexican goods across the US faster than the land route. Mr. Kuryla said goods from Mexico such as televisions, iPads and other electronics that come to Florida by water will then be sent by train to the main distribution center in Jacksonville and then be transported around the nation, a cheaper and quicker alternative. The memorandum of understanding would also largely benefit Florida, especially Miami-Dade County. Manny Mencia, Enterprise’s senior vice president of international trade & development, cited trade and logistics as the number one employer in the county. The added route would create more jobs in the sector to help gather the goods from Mexico and export goods there. The ports were not the only beneficiaries of the Mexico trip, as 35 Florida businesses reported to Enterprise how successful its matchmaking program was in giving companies that have never been to Mexico one-on-one meetings with similar business interests. Over 250 appointments were made for the companies. Mr. Mencia said estimates of sales projections for the businesses to generate deals exceed $23 million in the next 12 months after meetings on the mission. Companies’ feedback to Mr. Becker shows that some deals are already underway. Maxim Weitzman, managing director of Concept II Cosmetics, email him that his company is “already in conversations with one of the distributors” to close on a business engagement. Marco Flores, director of business development, International Medicine Institute at UHealth – the University of Miami Health System, went to collaborate on research methods concerning genomics with different hospitals and establish partnerships with medical universities for exchange programs – and because the university’s new president, Julio Frenk, is a Mexican who started in the health sector. “We thought this particular mission would be very beneficial for us because of his name and influence on the market,” Mr. Flores said. Mr. Flores also praised Mexico for already conducting genomic and genetic testing, something he hopes UHealth can learn more about from them. As business ties were being forged, Mr. Becker also emphasized stronger political relations between Mexico and Florida. 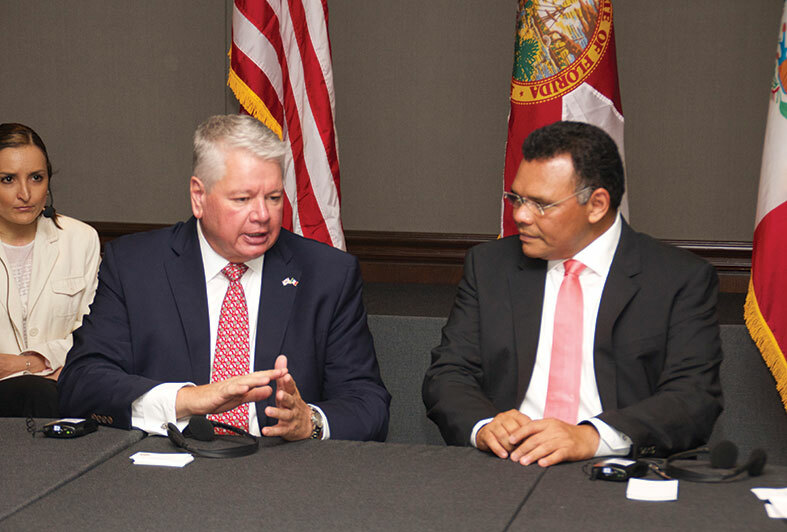 In that regard, he and outgoing Florida Secretary of Commerce Bill Johnson met with Mexico’s political leaders as a sign of goodwill.